The Last Drop Release No. 6 ($4,499, 750 ml), a 50-year-old blend of more than 50 Scotch whiskies. "I should have taken the helicopter," I thought to myself while sitting in traffic on the Long Island Expressway with New York City not too far behind me. Last Drop Distillers held a magnificent Scotch-and-cigar dinner at the old Guggenheim Estate on Long Island's Gold Coast. The company was willing to fly me from Manhattan via helicopter to the seaside estate for a tasting of their fine expressions, but I declined, opting for car service instead. I now regret it. Let me acquaint you with both the estate and Last Drop Distillers. First, the house. The Guggenheim Estate was built during the Gilded Age when Long Island's North shore was lined with stately, imposing mansions built by titans of the American industry—you know steel magnates, oil tycoons, financiers and your typical turn-of-the-century robber barons when capitalism was still unbridled and monopolistic. And when I say mansion, I don't mean the type of poorly constructed McMansions you see in so-called "upscale" areas today. No. These are castles built by unfathomable wealth. This one in particular is all brooding granite accented with ornamental Indiana limestone, trefoils, gargoyles and other gothic architectural ornamentations of a bygone era. It overlooks the Long Island sound (what self-respecting Long Island castle doesn't?) and sits in Sands Point, the area that inspired F. Scott Fitzgerald's seminal work The Great Gatsby. I think the actual Gatsby house is up the street, but most of these Gilded Age mansions have been demolished. Such is the melancholy fate for beautiful structures. 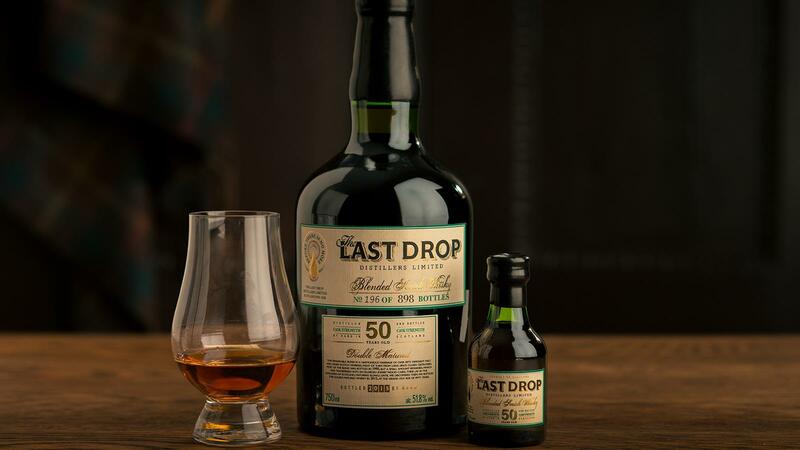 As for Last Drop Distillers, they are Scotch whisky negociants who set out to acquire rare casks from Scotland and around the world. Based on the resources and connections of founders Tom Jago and James Espey, these two spirits veterans formed Last Drop Distillers, a whisky firm whose sole purpose is to seek out the final barrels of nearly extinct vintages, pay top dollar for them and then create sublime blends of their own. Yes, I said blends. For the Scotch snob who believes only single malts can be true expressions of the spirit, I encourage you to try something from this young but noble house if you get the opportunity. Andrew Rankin is their master blender and is tasked with managing Last Drop's inventory of old, maturing whiskies while hunting for other fine, old and rare spirits. But the other night at the castle, neither Jago nor Espey were there. Instead, the tasting was presented by their daughters, Rebecca and Beanie. Rebecca is Last Drop's creative and operations director, while Beanie serves as the company's sales and marketing director. They not only have a surprisingly profound understanding of Scotch, but they know how to present it with poise. Case in point: the castle. It gives not only a majestic air to the Scotches, but a literary one as well. Second: the food. They did not rely on the clichéd banquet standards of the estate's catering services. Wedding food is simply not up to the task. Rather, they enlisted the skills of chef Hugue Dufour. Canadians from Montreal will know him from Au Pied du Cochon. New Yorkers will know him for his M. Wells Steakhouse, where he's imported his quirky Quebecoise form of gastronomy to Long Island City. Dinner and drinks were served at a long table in a regal room with an oversized fireplace that hinted at the excesses of The Jazz Age. And speaking of The Jazz Age, an unobtrusive jazz trio helped set the mood as we took our first sips of The Last Drop Release No. 4 ($3,999, 750 ml). It's billed as being 48 years old, but remember, with blended Scotch, the age statement only qualifies the youngest spirit in the mix. There are actually much older Scotches in this blend. Only 592 bottles of Release No. 4 were created. We may have had the last of it. Even a small sip unfolded massive layers of dried fruit, cloves, flowers, and a mouth-coating, buttery finish. Some of the Scotches in this particular blend are from distilleries that are long closed. As for which ones exactly, neither Rebecca nor Beanie would say. The Guggenheim Estate was built during the Gilded Age when Long Island's North shore was lined with stately, imposing mansions built by titans of the American industry. Next up, The Last Drop Release No. 6 ($4,499, 750 ml), a 50-year-old blend of more than 50 Scotch whiskies. It was first blended in 1995 as a premium 30-year-old (which will remain nameless). Last Drop acquired the remnant and poured it into a Sherry cask for a 20-year maturation. The result is a blossoming spirit of honey and fruit buttressed by dignified intonations of oloroso, earth and the spectral smokiness of a distant autumnal bonfire. Nobody at the dinner party picked up on the earthiness, and Last Drop's own notes don't indicate it either, but trust me when I tell you—it's there. Only 898 of these bottles were made. Finally the last spirit was a sneak sipping of Last Drop's next release, set to come out in September. I can't give you the technical details. All I can tell you is that it's a polished, detailed arrangement of whiskies, all of which are older than I am. Did I mention that there were cigars? Our small party retired to what I believe was once a billiards room. Last Drop procured a box of Cuban Bolivar Belicoso Finos from the Davidoff of London shop. "I carried them back in my bag and wasn't sure if it was legal," Rebecca said. Not to worry. It's legal now. In fact, she could have brought back four boxes had she wished. I became the de facto cut-and-light guy, as nobody brought any cutters or lighters, but that's OK. Scotch is their game, cigars is ours and I came prepared. The Bolivars were served with Matthieu de Gottal chocolates, each one cleverly gilded like an art deco bronze. Should you happen on any of these wonderful Scotches, I'd say a full-bodied cigar is in order. These Scotches are layered, complex and nuanced, but they are far from dainty. Choose bolder, earthier Cubans like Bolivar or Ramon Allones from the Cuban portfolio. From Nicaragua, Plasencia Alma Fuerte, Padrón Serie 1926, and from the Dominican Republic a Fuente Fuente OpusX or The Andalusian Bull from Litto Gomez (Cigar Aficionado's 2016 Cigar of the year). All of these smokes have the necessary underpinnings needed to stand up to hearty Scotches, but can match the Scotch's complexity layer for layer without overpowering its characteristics. Having grown up in America with The Great Gatsby as part of the country's literary canon, you can probably understand how boyishly charmed I was by the surroundings. I was, after all, sipping Scotch in Gatsby's West Egg. Though I'm willing to bet a shilling that neither Fitzgerald nor Gatsby ever had the pleasure of enjoying Scotches as storied as these.